So I haven't written about my faith recently, but it's no secret on what I believe in. I talk about it on my about me and have posts dedicated to it on this blog. I am definitely a Christian blogger, but it isn't the only thing that I focus on. While having a Skype date with a friend, we talked a lot about our faith and how it has affected our blogging. One thing that we both concluded was that it is hard to find other Christian bloggers out there. Or even if they are out there, they probably don't write about it on their blogs, at least not enough. Sometimes I'll come across Christian blogs that are solely Christian blogs or are written by older people for an older audience. Now these two things aren't bad. Don't get me wrong. But as a young, college-aged adult living in an age where Christianity is looking much different to my generation as far as music, pop culture, and even ways of living out our faith, it's hard to see so many lifestyle bloggers like myself either not have a religious affiliation or don't blog about it. I understand that people have different comfort levels and many other aspects like that, but where are my Christian bloggers at? You know that feeling when you find out you have something in common with someone? How much more satisfying is that feeling when that person shares the same or similar values as you? That's how I feel when I meet a Christian blogger who is similar to myself--a young adult, lifestyle blogger who also happens to share her faith on her blog. 5. Wanting to share your struggles with your faith (whether with another blogger or on your blog) but don't know anyone/someone you trust enough to confide in. I'm going to explain that last one a little bit more and preface that you probably know some people in real life that you can talk to, but there is something about being able to talk with someone who is similar to you in that you both share your life and thoughts online for the world to see, so they have a different perspective and viewpoint than a non-blogger in your life. And when I talk about Christian bloggers, I'm talking about bloggers that describe themselves as Christian, but aren't necessarily writing about it all the time. Twenty-something lifestyle bloggers with a Christian faith are what I'm looking for. However, if you're not twenty-something or not a lifestyle blogger but have a Christian faith, please share your blog with me! I'd love to check you out! If you're a Christian blogger (you don't have to primarily write about it), can you relate? And can you leave your links so I can check out your blog and some of your faith posts? If you don't blog about your faith, other than it not fitting into your blog niche (i.e. you're a fashion blogger), why do you not write about it? If you're not a Christian at all, do you ever read faith-based posts? What do you think of them? I read all the posts in my feed. I feel like it's always important to keep learning. I can totally relate to this, Kriselle!! I am currently drafting a post on singleness, and I keep finding myself deleting and re-writing parts that seem too "Christian" for fear of what non-Christian readers might think. I know that sounds terrible, but anyways I really relate to what you're saying here!! Originally on my first blog that I wrote in high school I wrote mainly about faith- that was the focus of my blog. But now I want to have a fashion blog.. but to be a fashion blogger who is a Christian. And man it can be tough!! So I feel you, sister! I am a Christian writer but never talk about it on my blog. Only reason I do so is because it doesn't have to do with anything on my blog. That and back when I used too I would get hate mail for the type of lifestyle I live. Aka talking about dating on my blog then. So I just stopped. I think we all get a little a nervous to ever share something others may deem "controversial". Just remember to write what you want and what you feel, religious or not, because this is YOUR blog. I learn new things from all of the blogs I read and faith based blogs are no different. I rarely talk about my faith on my blog...mostly because I just haven't figured out how to talk about it without making people feel like I'm pushing them towards something. I'm a pretty open book, so I'll read about any religion or lack of religion and be fine with it, but not everyone is that way. I just had this struggle not too long ago about deciding what to share and ultimately it's your place. You might lose a few readers but those who are truly into what you do and say won't mind a different post from time to time! I can definitely relate to this. I don't blog about it, but I am a Christian. I don't really feel comfortable talking about that kind of stuff even amongst my friends so I don't blog about it either. My favorite Christian blogger would be Gina at Gina Alyse! You should go check out her blog!! 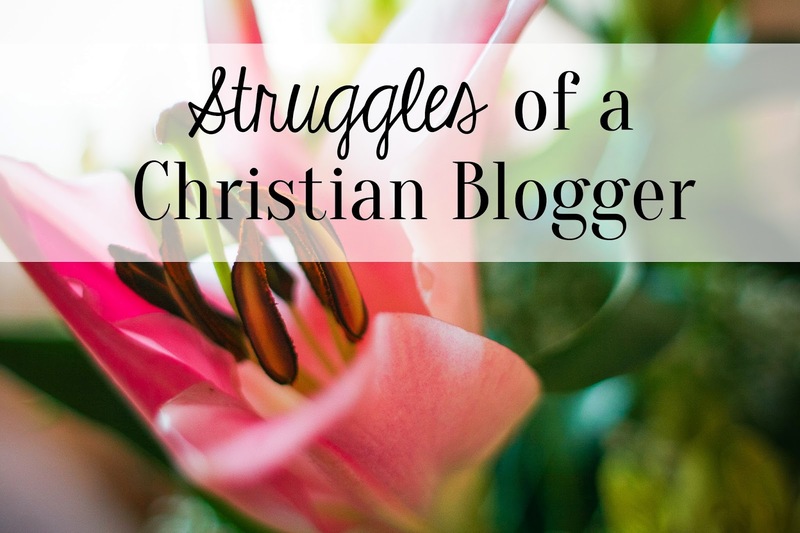 I am not a Christian blogger, but I relate a lot to your Christian blogging struggles. While I believe in Christ and much of the bible, I admit that I am more spiritual than religious. Because of my more liberal, non-religiously defined beliefs, I often find myself unsure if I should publish anything that is faith-based (if it is too controversial, inflammatory, painful, narrowminded etc...) because I have been attacked for it in the past by friends in person. I never know how people will respond. Vulnerability is a bit nerve wrecking for me. Plus, I never want anyone else to feel bad for having their views. I never want more conservative or "true" Christians or non-Christians to feel like I am targeting. My friend base is hugely diverse - Christians, Buddhists, Wiccans, etc... - so I always want to stay respectful. It seems like faith, whatever it is, is a real struggle to incorporate. I do really want to incorporate it more, though. Do you have any tips? Hey girl I'm a blogger over here and I'm a Christian. My faith in Christ is integrated throughout my life, and I share my faith on my blog when I have something on my heart, but I don't talk about it ALL the time. When I do write something pertaining to my faith, I try to write it in ways that can be relatable for people who don't understand "Christianese." Anyways, I'm so excited to connect with you about this! Yep, this post is very timely. I am a Christian blogger, never had a problem with sharing my faith. I write on everything from relationships, lifestyle, Korean dramas and more. I don't think the problem is faith-sharing, but finding a balanced approach to it. At this point you have to decide HOW you want to be known as the "No-nonsense, no excuse Christian" with a friendly and easy-to-relate-to image without watering down the gospel. 1) Do a temperature check with your audience and YOUR voice: Do a post that is close to your heart and not one that comes from the head. This is how you can test your voice. Do you sound revolutionary? Are you advocating for a change and heavy-handed? Or do you want to start a conversation? The temperature check with your audience is their reaction to your message. What was the reception like? 2) Find better ways of spreading the message: I have one philosophy for Christian bloggers--- have a story on hand. Stories will take readers places where facts can't. This was a fun read, Kriselle! I love seeing this! I blog mostly christian stuff. Trying to expand to general living in a way that Christ always shines through. Looking forward to going through your posts! Awesome. Thanks for your input, Yvonne! I appreciate it! Ahh I can always count on you girl! You are one of the first Christian bloggers that I have met and am thankful to know that you deal with the same issues as me! As someone who is in a similar boat of wanting to write about more "secular" topics, I feel ya. The hardest part about being a Christian fashion blogger is creating outfits that are stylish but at the same time not compromising your morals about modesty. I remember your bikini post about this last year. So I am with you 100%! As far as your singleness post, I say that it is so important to make it clear from the beginning that all of your thoughts are your own and that you aren't trying to push down on anyone else for thinking differently. I think the biggest issue is when people don't make that clear, so some people may just assume that they're trying to just be "holier-than-thou." Other than that, I think you should write from the heart and post it! Although I'm not technically single (as in, in a relationship but not married), I can't wait to read your post! Thanks for sharing about your reasons for not writing about your faith, Paulina! I understand that it's so difficult to deal with the negativity that can surround writing Christian posts. That's what I worry about at times as well. But I appreciate your opinion on this! Great! Thank you for your encouragement, Krista! It's great to know that even people that may not necessarily be religious still are able to appreciate religious or faith-based blogs/posts! I've been noticing that trying not to offend people is one of the most difficult parts of being a blogger who is a Christian or has a faith of some sort. It's like we want to share something so important about us to the world but at the same time we don't want to scare them away. Thank you for sharing your thoughts and your experience, Jessica! I understand how you feel about being attacked by friends before, Katie. Totally understandable. With the way that I've been experiencing Christ, it is definitely a lot more different and almost "radical" than how I grew up in the church. However for me I'll still talk about it mostly because I'm normally pretty open about everything, but I get that so many people are intimidated by the thought of sharing something so personal with a bunch of strangers online. I also grew up with friends from all different beliefs as well so I learned early on that it's important to respect others and their beliefs. As far as incorporating your faith into your blog, I say you can start out with inspirational posts. If I find something encouraging and feel like it is worth sharing with my blog readers, I will write something surrounding that concept and maybe add a relevant Bible verse or something about how it can be applied to your faith towards the end of the post. That way, people can get encouraged or get a feel with how you are in your faith but you still get to show that it's not from you that you're able to share what you're sharing, but that it's from God alone. Or one of my first posts really integrating my faith was about dating and I incorporated some of what I believe based on my faith into the post as well. Little things like that help. If you have any more questions please don't hesitate to ask or email me! Thank you for sharing, Natasha! I will definitely be checking out your blog! Thanks for sharing, Raewyn! And I know you may or may not be comfortable with it, but if you ever do decide to share your beliefs one day, I would love to read about it :] Thanks again for your encouragement! Thank you so much for commenting, Gina! I found you through Miss Alk last year and have definitely been following you on your journey through your blog! Thank you for that post by Kerrie Williams and for your encouragement! It is so great to meet other lifestyle bloggers trying to integrate their faith into their blogs like I am. Woo! Wow, thanks for your advice, Maggie! This is all so great and I definitely will be taking these tips into account for future faith-based posts! I already kinda do the second tip when I can, but the first one is something that I definitely will have to do soon. Thank you! I think people don't write about faith just because they know that sometimes other people can judge about their faith or receive hate because they not agree on what they write, is something very delicate talking about your faith to people and I'm talking about myself, yeah. And I don't read faith-based posts, don't know why. In a growing blogging society, the amount of followers is such a huge determinant for being "famous" or "successful" - so much so that we tend to miss out on good content trying to please everyone who could possibly stumble across our words and pictures. You are right, we all should be okay with being us, even as Believers, since it is our space to share ourselves with the world. That is what should be our determining factor of "success." Thank you for sharing! It's ironic that you mention this. I, as a Believer, struggle with this exact same thing. I tend to feel so hypocritical if I talk about it to the world via internet but don't make it a part of my regular conversation in face to face interactions. I have seen the Lord use it, at times, as an accountability type thing to encourage me to talk about it more. But it is HARD. I, too, tend to lean more on the liberal side of politics for various reasons (which I will refrain from in this venue at the moment). I am also very philosophical in my thinking (and more and more in my writing). All that being said, I can really relate to where you are coming from. I have gotten a lot of controversy from my more conservative group of friends, and it is hard. I think you just have to write in such a way that clarifies that it is your views and beliefs and you desire for your readers to have the same open mind that you have...if for no other reason but to have good, amazing discussions in the comment section about life, purpose, and everything! I couldn't agree more with what Kriselle said. Just let it start to "leak" out. If you feel called to put something in a post, do it. Don't let it stop you. As much as vulnerability is tough, it is a beautiful thing; I believer your readers will appreciate it. Added to my reading list! Yay!!! I echo Kriselle's words: I cannot wait to read your beliefs when they are published on the interwebs (I may or may not be pressuring you know to do so...I am intrigued). I love reading those type of things! TEACH ME. Most days, I am so lost and confused on where to begin and how to make it "readable" to everyone. I admire your courage, strength, ability to be who you are in Christ so open for the world. I cannot wait to read more of your blog (I agree with Kriselle...share your link)!!! You are right - having a group of Christian bloggers to get encouragement from is so amazing. I just recently starting having that with Kriselle and can't wait to get to know you and several others through all of this. What you said about still writing about fashion, food, and other topics reminded me of "Desiring God" by John Piper...enjoying everything God has created. I am currently reading the book and love it! Have you read it? I'd love to connect via Facebook or Twitter! WHOA. This is some amazing advice. Advice I will take to heart. I cannot tell you how much I admire you. Thank you for sharing (and keep the advice coming. God knows I need it). I cannot wait to read them and get some encouragement! Added to my reading list! Finding balance and incorporation is the hardest part. It is something I, too, and struggling with how to blend and what to share with the ENTIRE world. I really hope we can encourage each other in this. Ellie, I cuss like a sailor - some days are worse than others. I feel ya. Those and margaritas...they put a hurtin' on me. Ain't it beautiful that He loves us unconditionally? I fail Him too much. Religion is such a sensitive subject to talk about, write about, and read. Finding that balance is so hard. I can certainly understand. Now, I am a 21 year old Christian (have recently found true faith in 2013, even since being raised as Catholic), and am brand new at blogging since I started to write seriously (I'm working on a debut novel). My blog http://loveliterarylife.wordpress.com/ is focused more on my life and interactions with my two incredible daughters, my partner and my furry little children, but not at all on my faith (yet). I suppose I am afraid that people will see the word "Christian" or "God" and be turned away instantly before being exposed to the beautiful purpose of having faith, and thus will avoid my writing altogether. It's saddening that I am fearful of that but being an amateur, its very difficult not to be. Good luck with your writing, you are a wonderful person! I am so excited that this has encouraged you to post it! I cannot wait to read it. Be sure to post a link here. haha, I will get to work on writing one. It may take awhile because it's kind of complex and goes back and forth because I don't delve into it as often as I should. I will write something though! Also, it is a great blogging motto! I'm all about blogging for yourself. True readers will stay, if they don't stay then you don't need them anyway! Thanks Emma! I visited yours ... Your raw honesty inspires me! I can't wait to read it!!!! I'm excited! I was literally looking for a lifestyle blog that i could read of another person who is Christian. Im so happy that I found your blog! Wow I never saw this comment until now. Thank you for visiting my blog and commenting, Rebecca! And I understand how that is a little daunting for bloggers. Many bloggers don't write about their faith on their blogs for that reason. And I say write about it when you're ready! Your true readers will see what you're writing and learn not to judge you or to think anything negative of you because of it. If anything, they may just commend and respect you even more for being honest and standing up for it. Once again, thank you for visiting and good luck with your writing as well! Your blog looks great aesthetically!! So grateful to have found Livin' and Lovin'... I too am a Christian Lifestyle blogger over at Haiku House. I would be thrilled to have you stop by sometime! Peace & many blessings to you Kriselle!